This is a 40 year old club chair, restored. I started by removing all the fabric. After all the fabric was removed, I removed all the cotton and padding, so all that was left was the frame and springs. The quality of the frames today can not compare to the frames from 40 years ago. Manufacturers used solid wood, dowels and glue 40 years ago. Some of the manufacturers today, just use framing staples to hold the frames together. Once this 40 year old club chair is upholstered it will last another 40 years, outlasting most of the furniture made today. The fabric used for this upholstery job is a Charlotte Fabric R 151 Cayenne. It is 86% Polyester, 14% Acrylic. In the photo below you will notice the spring system of this occasional chair. This club chair has coil springs, with an eight way hand tie. 8 way hand tying means the springs are tied from front to back, side to side, and then from corner to corner. When it is completed you should be able to count eight knots on every spring. When buying new furniture with coil springs. 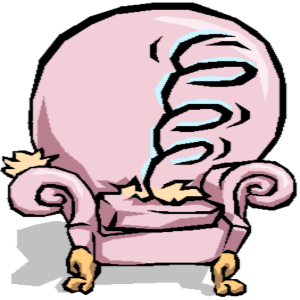 Lift the cushions off the sofa or chair and feel the knots on the springs through the decking. (The decking is the fabric under the removable cushions) Make sure you are getting a well built piece of furniture, for the money. Before I can proceed to upholster this club chair, I cut all the old twine off the springs. Then I retied the springs, by hand. Some stores only do a 4 way hand tie. That leaves spaces or gaps in between the springs. I did an eight way hand tie, because it makes the springs more secure, and there are no spaces or gaps in between the springs. After the springs were all retied, I replaced the burlap, and sewed the edge roll on. I added new cotton over the springs and proceeded to upholster. This 40 year old chair is a great example of quality furniture. Finding this old furniture and upholstering it with your own flair, is better than any furniture found in any store. This butterfly fabric chair is a great example of taking old furniture and making it new again. We took this vintage chair and restored it. First and foremost we stripped the chair down to the frame. Then we re-tied and re-webbed the springs, replaced the burlap, added new cotton and padding. Then continued to upholster it using the butterfly fabric from Charlotte Fabrics. Making this vintage chair desirable again. The fabric for this upholstery project used Charlotte Fabrics I9000-09. Once the chair was upholstered, then we cleaned and touched up the legs. What a gorgeous chair. We love sharing our projects to create inspiration, and offer expertise to others. We look forward to creating great posts to share with you.